Google and the other search engines index and retain so much data, the issue is not if they have the answer, it is a case of which is the best answer. All search engines use multiple calculations in an algorithm to help ensure we find what we are looking for on the first search. Primarily there are three variables: Affinity (association), Weight, and Time Decay. Basically, the closer a user is to you, i.e your brother, sister, etc, the more likely you are to see their story. Photos/videos carry more weight than links and links carry more weight than plain text updates. Try and use any new features as Facebook seems to place more weight to new features. As a post ages it loses value unless it gets interaction. Right, so what can you do if you are running a Facebook page or campaign to help increase your chances of featuring more frequently in people’s news feeds? As ever, don’t just post things for the sake of posting them! 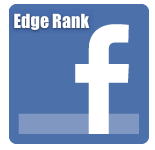 If you have any questions that you’d like the answer to or any comments about your experience with Edge Rank please feel free to drop us a line in the comments section below.